Your digital communications impact your market position and awareness more than any other communication channel. Your website, social media, digital advertising, and e-communications need to convey your benefits and offerings in a way that resonates with prospective students. 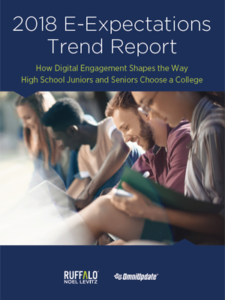 This report from Ruffalo Noel Levitz and OmniUpdate examines the behaviors and expectations of high school juniors and seniors as they research colleges online. The findings cover website content, social media, net price calculators, email, texting, and much more. RNL Digital Marketing and Creative Services enable you to create a compelling digital presence. From complete website development to testing and analytics, no project is too big or small, and we’ll make sure the solution we propose meets your goals. Add compelling digital content across multiple channels to attract students and encourage them to enroll. You have already worked hard to create an e-communications program at your campus. We build on your efforts, and we stay by your side to make sure what we propose turns into a working reality for your campus. Call 800.876.1117 to have a free consultation with our Web and Interactive Marketing strategists.